The Akō Incident began when one of the Shōgun's court officials insulted a feudal lord, who then assaulted that official. The feudal lord was compelled to commit suicide. Forty-seven of his warriors, now masterless samurai or rōnin, swore that they would take revenge by killing the official. They waited over a year. Their leader lived a conspicuously dissolute life in Kyōto to give the impression that he had no plans for revenge. Then one night the rōnin struck. They killed the court official. They sent one member of their group to the home district of their master to report that his death have been avenged. The remaining 46 turned themselves in. They were then, as they had expected, compelled to commit suicide. 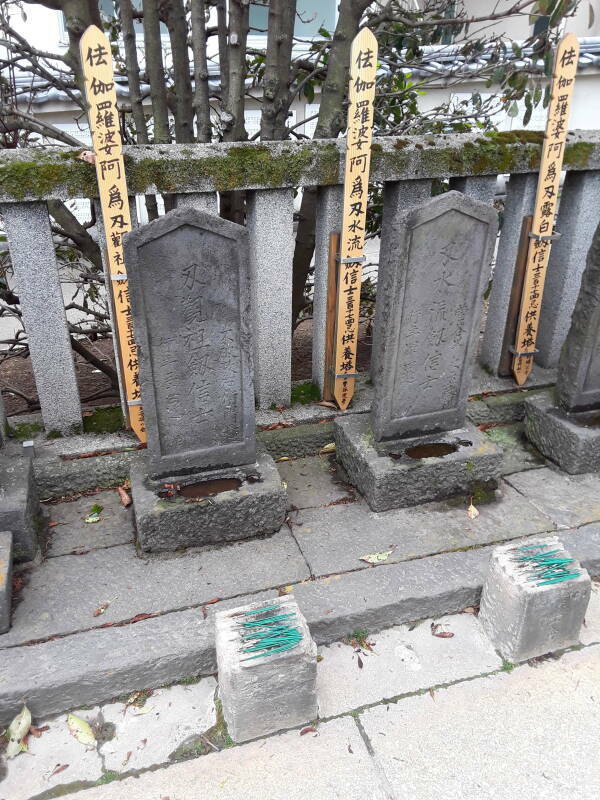 Today you can visit their graves at a temple in southern Tōkyō. Sengaku-ji is a Sōtō Zen Buddhist temple. 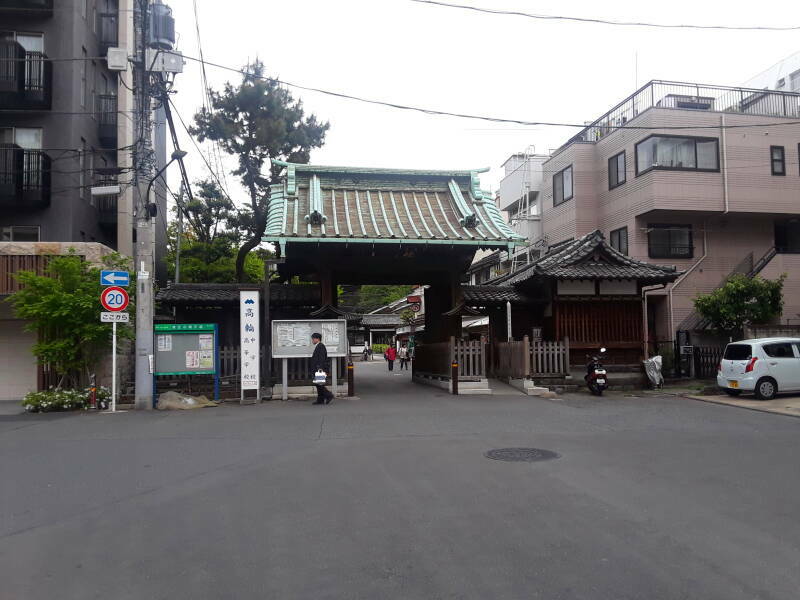 It's a short walk, just about two blocks, from the Sengakuji Station on the Toei Asakusa Line of the Tokyo Metro. The Shinagawa Station on the Yamanote Line is a little further away. Sōtō is the largest of the three traditional sects of Zen Buddhism in Japan. It arrived from China in the 13th century. It emphasizes Shikantaza, meditation with no objects, in which one strives to be aware of one's stream of thoughts, allowing them to arise and pass with no distraction. Shintō has always been associated with the Emperors. When history first began to be recorded in Japan, around 700 AD, the first "history" written down was a collection of legends telling how the mythical first Emperor Jimmu was the descendant of the creator gods. Since then there has always been an Emperor or Empress in that one supposedly divine line of descent. But for several centuries, from 1185 to 1868 (with a few gaps), Japan was ruled by a Shōgun or military dictator. The Emperor stayed in Kyōto, carrying out the rituals necessary to maintain and protect Japan, while the Shōgun ran things. The Shōguns were Buddhist. Kamakura is a short distance south of Tōkyō. It became the 4th-largest city in the world during the Kamakura Shōgunate, when Japan was ruled from there. 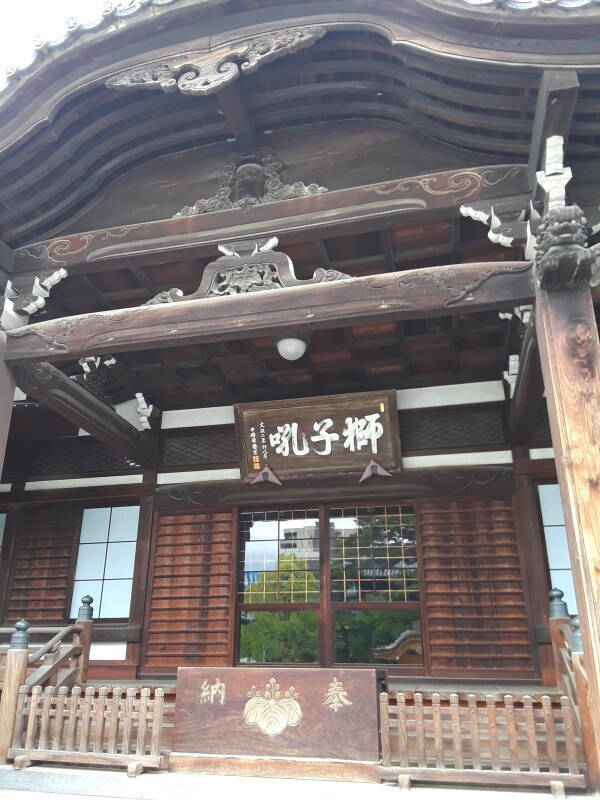 The Shōguns built several significant Zen Buddhist temples and monasteries in the area. 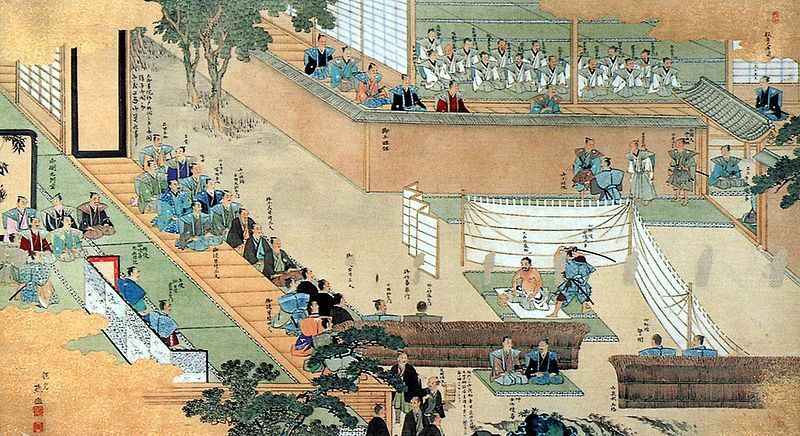 In the Edo period from 1600 to 1868, during which the 47 rōnin took their revenge, Buddhism lost some of its influence. But Sōtō Zen Buddhism remained a significant movement. Here we're approaching the temple, coming up to the Chumon or Middle Gate. Bodhisattvas flank the path as you approach the main gate. 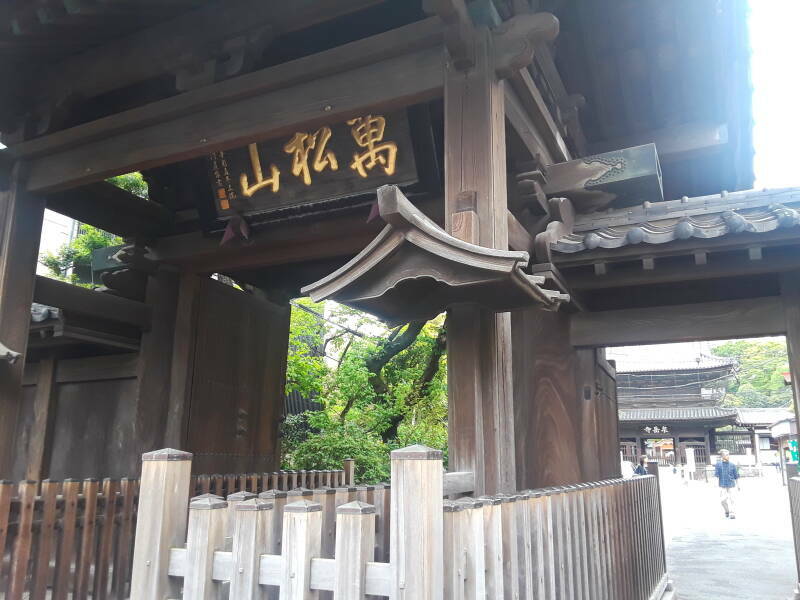 Above is the main gate, the sanmon. Gates mark passages into increasingly sacred space. The gate has one or more entrances but no doors. You can pass through the gate but you can't close it. That emphasizes how the gate is just a symbolic boundary between the normal world and sacred space. As usual, this gateways is flanked by statues of two deities, behind the taller lattices on either side. 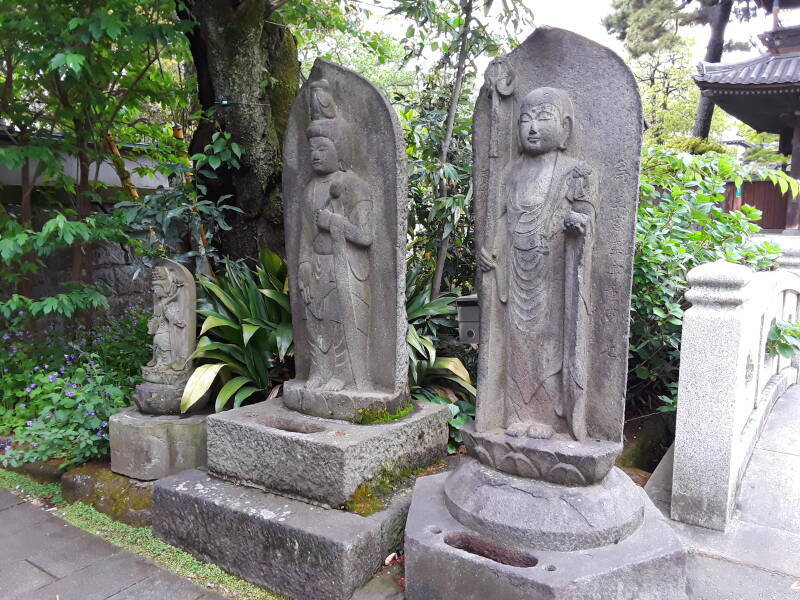 These are the Niō, originally Hindu deities who have been incorporated into Buddhism. Their fierce appearance keeps demons and evil spirits and thieves out of the temple grounds. Typically, the deity on the left has an open mouth, pronouncing the sound of the Sanskrit letter अ or A, while the deity on the right has a closed mouth, pronouncing the sound of the Sanskrit latter म or MA. Together they pronounce the sacred syllable Aum or ॐ. Aum is the sacred sound of Hinduism. But it is used as a mantra in Buddhist, Jain, and Sikh practice. 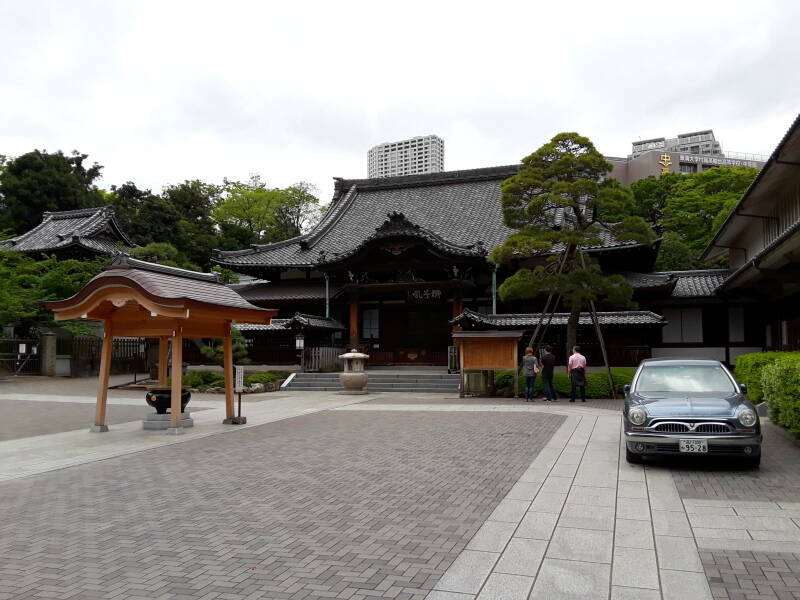 Beyond the last gate is the hondō or main hall. It was April 21, 1701. This was the Edo Period, from 1603 to 1868. The Shōgunate was based in Edo, which had been a fishing village. Edo grew into a large city while serving as the capital. Matthew Perry led U.S. Naval forces into Edo Harbor, starting in 1853, forcing Japan to open its ports to foreign ships. The Shōgun couldn't maintain Japan's centuries of isolation, so the nation lost confidence in the Shōgun. The Emperor was restored to full power and national leadership with the Meiji Restoration in 1867-1868. The Emperor moved his court to Edo, which was renamed Tō-kyō or "East Capital". But in 1701 Japan was still in a feudal system under the military leadership of the Shōgun. A samurai was under the command of a daimyō, a feudal lord or master. A rōnin was a samurai without a master. A samurai would become a rōnin when his master died or fell from power, or if his master dismissed him. The Bushidō Shoshinshu, the Code of the Warrior, held that a samurai should perform seppuku, ritual suicide, when he lost his master. Those who didn't became wandering rōnin. During the Edo period, rōnin were forbidden to take employment from a new master without the permission of their previous master. And if your previous master was dead, you were stuck as a wandering rōnin. Asano Naganori was the daimyō of the Akō Domain, a relatively small fief west of Osaka. 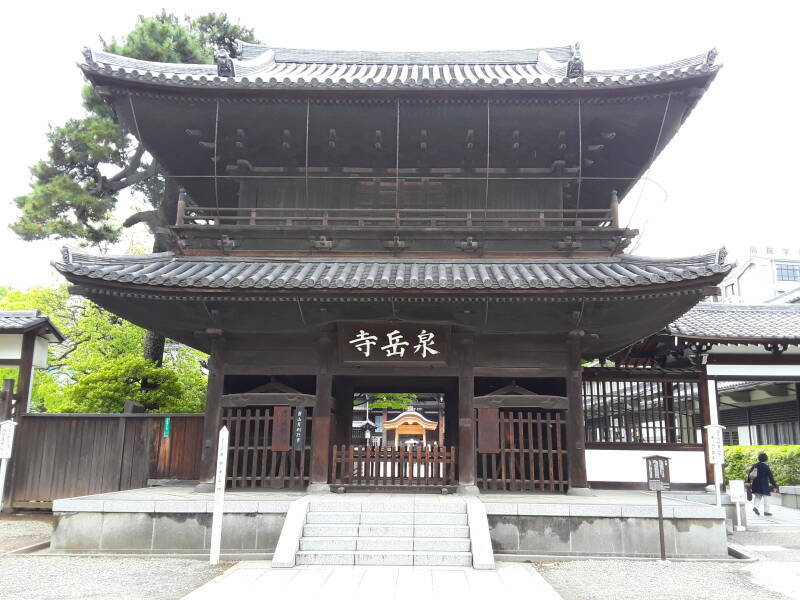 After serving in several minor offices of the Tokugawa shōgunate, he was appointed as one of two officials who would host emissaries from the Imperial Court in Kyōto when they visited the Shōgun's castle in Edo. Kira Yoshinaka was a kōke or Master of Ceremonies for the Shōgun. He was in charge of court protocols and etiquette, which would have been very elaborate when emissaries of the Emperor met with the Shōgun. Asano and Kamei Korechika, Asano's partner in envoy-hosting, were ordered to set up a reception for the Emperor's emissaries at Edo Castle. Kira was instructing them. Kira became upset because, as he would put it, they gave him insufficient presents, the time-honored compensation for such instruction. Or, more bluntly, they didn't pay the bribes he wanted. Baksheesh makes the world go 'round. Kamei, Asano's partner, quickly became enraged by Kira's insults. He was ready to kill Kira. But then Kamei would be killed and his entire clan punished. Kamei's counselors quickly and quietly gave Kira a large bribe, and Kira immediately began treating Kamei nicely. Asano, however, had not given any baksheesh. So, Kira kept abusing and insulting him. "Ill-mannered country rube", and so on. Asano finally had had enough. Asano drew his wakizashi, his short sword used for close-quarters battle, and went after Kira. Yes, the wakizashi, as they were indoors. They were in a grand corridor in Edo Castle. Katana and wakizashi in the Japanese National Museum in Ueno Park in Tōkyō. Katana is the long sword, with a blade about 60–73 cm long. Wakizashi is the short sword, with a 30–60 cm blade. The pair, carried by a samurai, is called daishō, meaning "big-little". Yes, Deadpool is eccentric for wielding two katana. Among other things. Asano wounded Kira with his first strike, cutting his face. His second strike missed and hit a pillar. Then the castle guards descended on them. Asano was doomed. It was forbidden to draw a sword out of a scabbard within the castle, let alone to attack one of the Shōgun's officials. 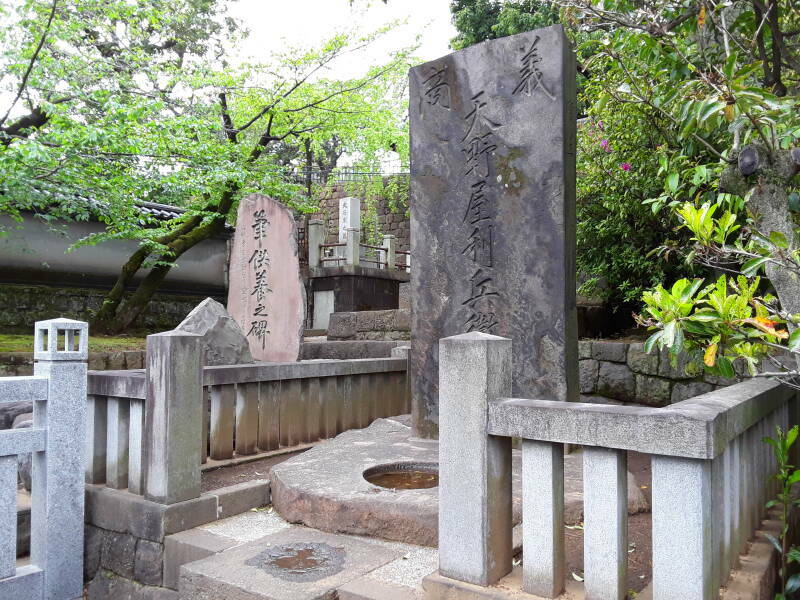 Asano was ordered to kill himself by seppuku. 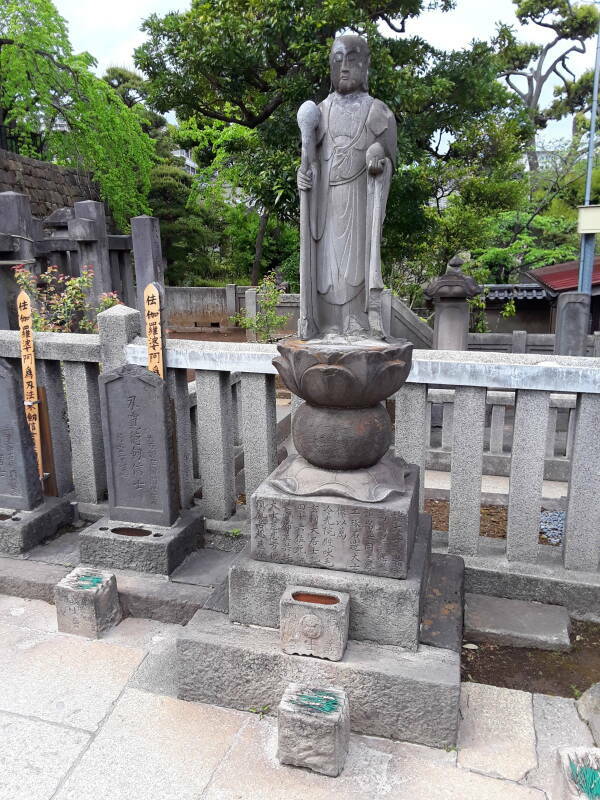 His goods and lands would be seized, his family would be financially ruined, and his samurai would be made rōnin, forbidden from serving another lord and explicitly forbidden from taking revenge. Seppuku is a uniquely Japanese form of ritual suicide by disembowelment. It was used voluntarily by samurai to avoid capture (and, probably, subsequent torture) on the battlefield, and it was a form of capital punishment. It seems to have been invented by Minamoto no Yorimasa during the Battle of Uji in 1180. Given the ritual and ceremony that had built up by the Edo Period, seppuku is said to be "performed" instead of "committed". Bathe, have a last meal, dress in a special white kimono (blood and viscera are awfully hard to get out of white), and write a death poem. 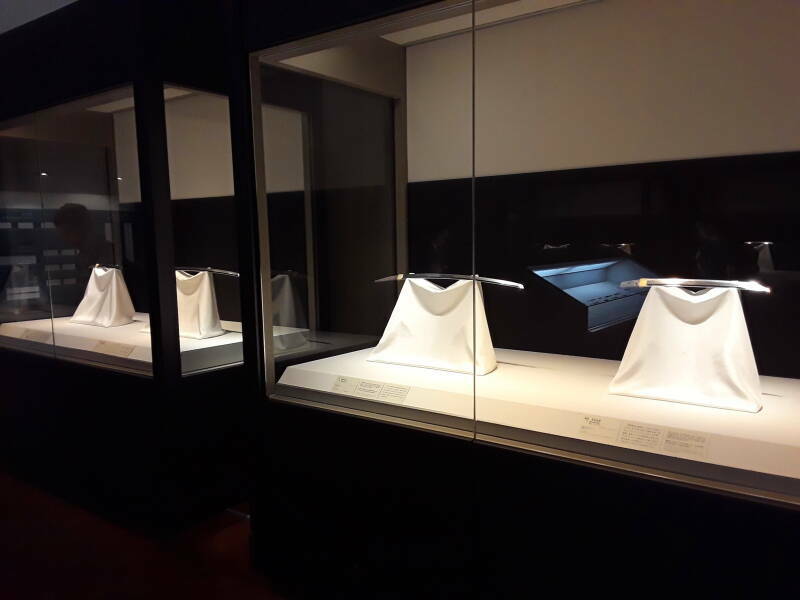 Then sit in a special seat, open the kimono, and use the wakizashi or tantō (dagger) to make a left-to-right cut across the abdomen, ideally severing the descending aorta. The "second" or kaishakunin standing nearby would then use his katana to cut most, but not all, the way through the neck. That took an expert swordsman. As the ritual evolved, the second would strike when the dagger first entered the abdomen. Then later, when the samurai first reached for his blade. Japan abolished seppuku as official punishment in 1873, but its voluntary performance continued. Many soldiers performed seppuku during World War II, and even more plus several civilians did so at the end of the war. 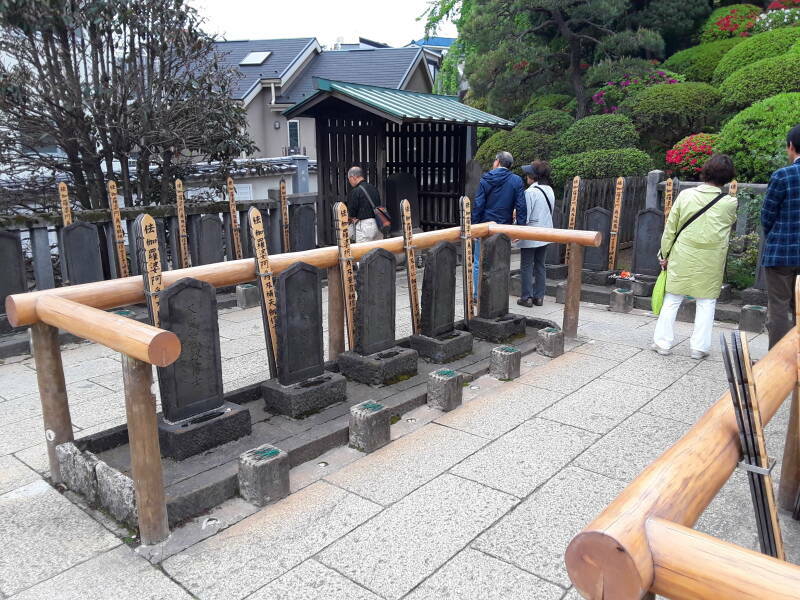 So, Asano performed seppuku in April 1701. 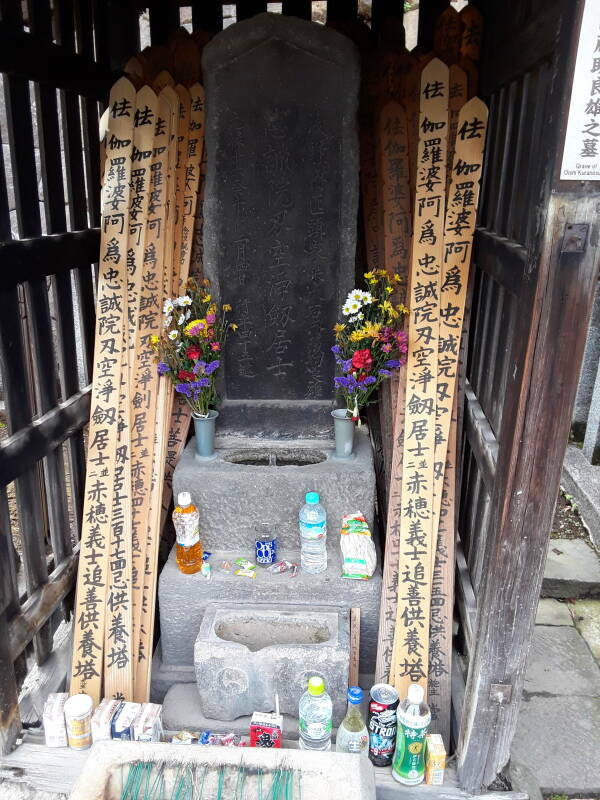 This is the Chizome, the Blood-Stained Plum Tree and Stone. 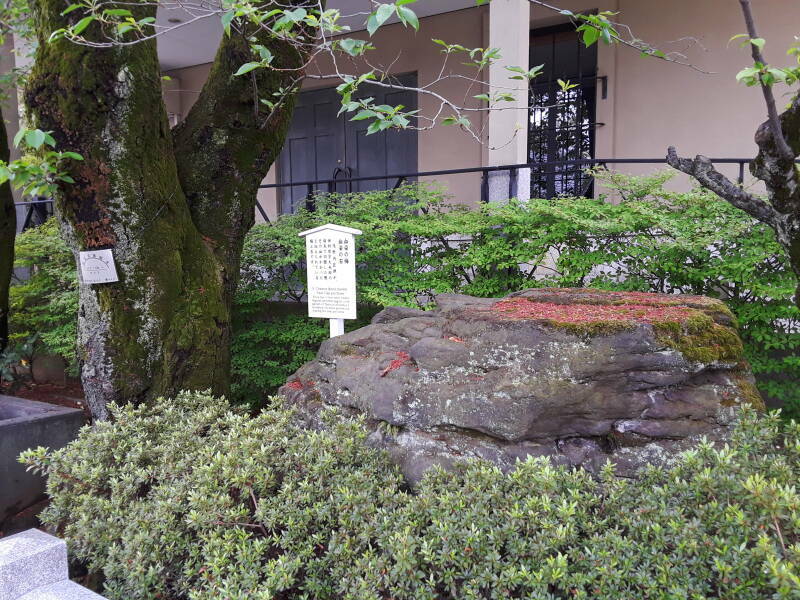 The story is that Asano performed his seppuku right here, and his blood sprayed out and stained this tree and stone. Forty-seven of Asano's rōnin swore a secret oath that they would take revenge by killing Kira. Kira expected this, of course. He made sure he was well guarded, and sent men to watch the rōnin. Ōishi Yoshio, leader of the 47 rōnin, ordered the men to surrender Asano's castle in Akō. He then moved to Kyōto and began frequenting brothels and getting spectacularly drunk. One day he was returning home very drunk, fell down in the street, and went to sleep. This was not typical samurai behavior. Kira's spies observed all this. Kira concluded after a year and half that Ōishi and the other rōnin were no threat. Ōishi had divorced his wife and sent her and their two youngest children to live with her parents. He gave Chikara, his oldest boy, the choice of going with them or staying with the secret rōnin group to fight and die. Chikara chose to fight. Meanwhile the other 46 rōnin were spying on Kira. They had taken jobs in Edo as merchants and workers, and had gained access to Kira's home to familiarize themselves with its layout and the staff. One of them had married the daughter of the man who had built Kira's house, just so he could access the detailed house plans. In December 1703, Ōishi and his men picked a night with high winds and heavy snowfall. Armed with the swords and bows they had smuggled into Edo, they struck. They subdued the guard at the outer gate, and sent messengers to the neighboring houses to explain what was going on. Revenge, not burglary. The whole neighborhood hated Kira, so they were happy to sit back and watch the revenge go down. Ōishi posted archers on the roof, then they attacked the front and rear gates simultaneously. The two groups of rōnin joined up inside, having killed 16 of Kira's men and wounding 22 others. They hadn't found Kira, but his bed was still warm. They eventually found that a large hanging scroll hid a doorway to a secret inner courtyard. 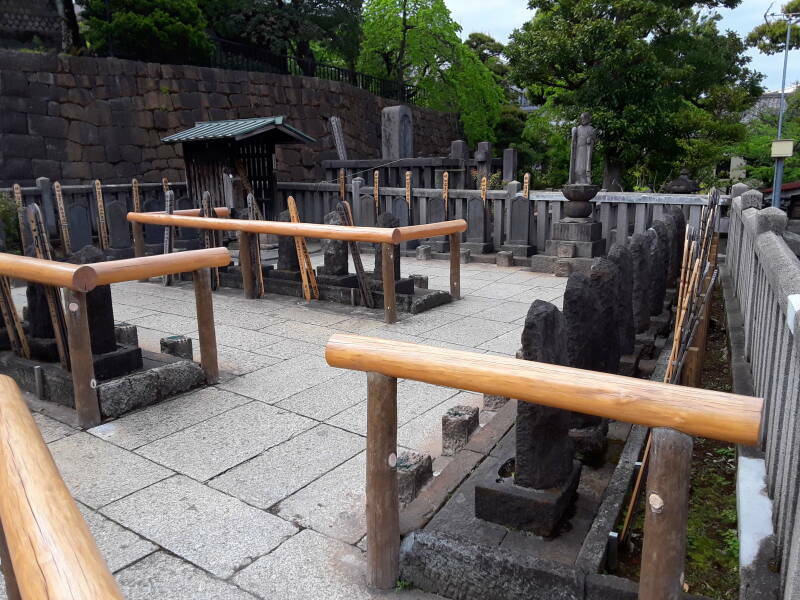 There was a shed storing firewood and charcoal in that courtyard, and Ōishi's men killed two more armed defenders who had been hiding in that shed. A man was still hiding in the fuel shed, he came out with a tantō but he was easily disarmed. The man refused to say who he was, but with the light of a lantern Ōishi saw that it was Kira. The scar from Asano's attack made it definite. Ōishi got on his knees and spoke respectfully to their captive, in consideration of Kira's high rank. He invited Kira to die honorably, like a true samurai, and offered the wakizashi that Asano had used. He offered to act as Kira's kaishakunin or second, to spare him a gradual death by exsanguination. Kira just shivered and didn't speak. Ōishi finally gave up, told the other rōnin to hold him down, and cut off his head with Asano's wakizashi. 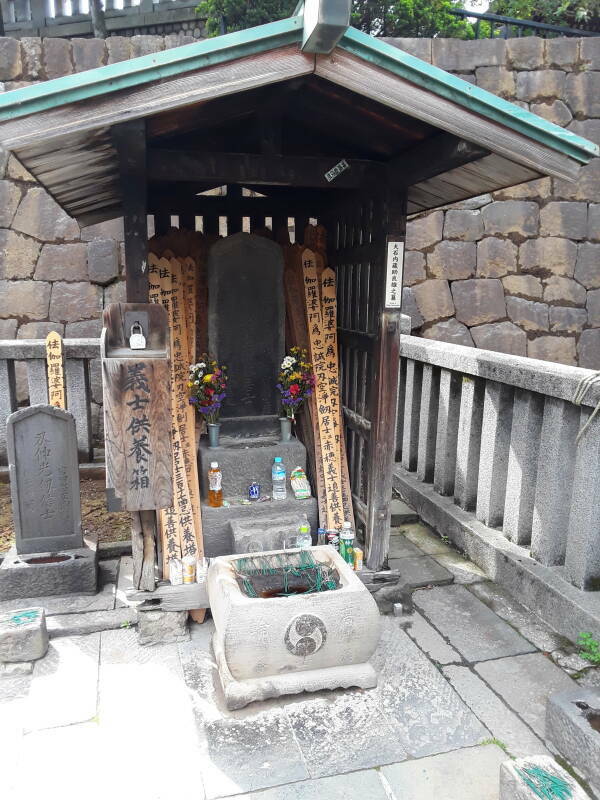 They sent one of the rōnin, Terasaka Kichiemon, to travel to Asano's fief of Akō and report that his death had been avenged. Then the remaining 46 rōnin hurried across the city to Sengaku-ji, carrying Kira's head. The stories tell that everyone along the way praised them and invited them to stop for refreshments. Kira must have been very unpopular. 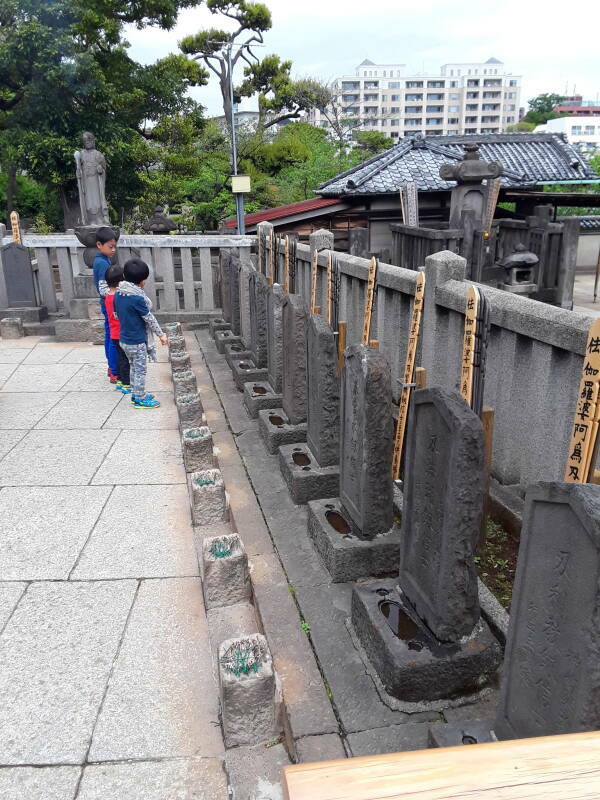 They washed Kira's head and laid it and the wakizashi at Asano's grave. Then they prayed at the temple, gave its abbot all their money, and asked him to bury them and offer prayers for them. Then they turned themselves in. As they had expected, they were sentenced to perform seppuku. This print depicts Ōishi performing seppuku with the kaishakunin ready to strike. 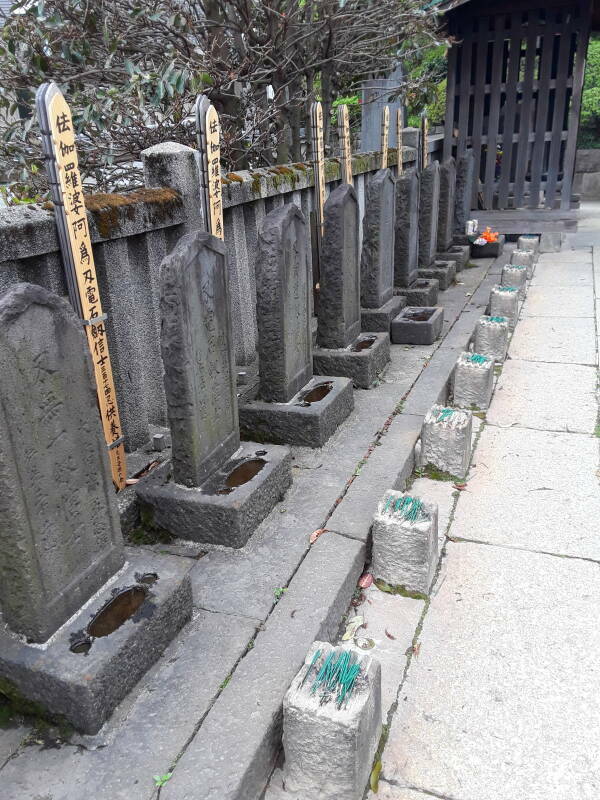 Let's continue past the temple to the graves of the 47 rōnin. Yes, all 47. Terasaka Kichiemon eventually returned from Akō and was pardoned by the Shōgun. When he died of natural causes around 1747, at the age of 87, he was buried here with his comrades. 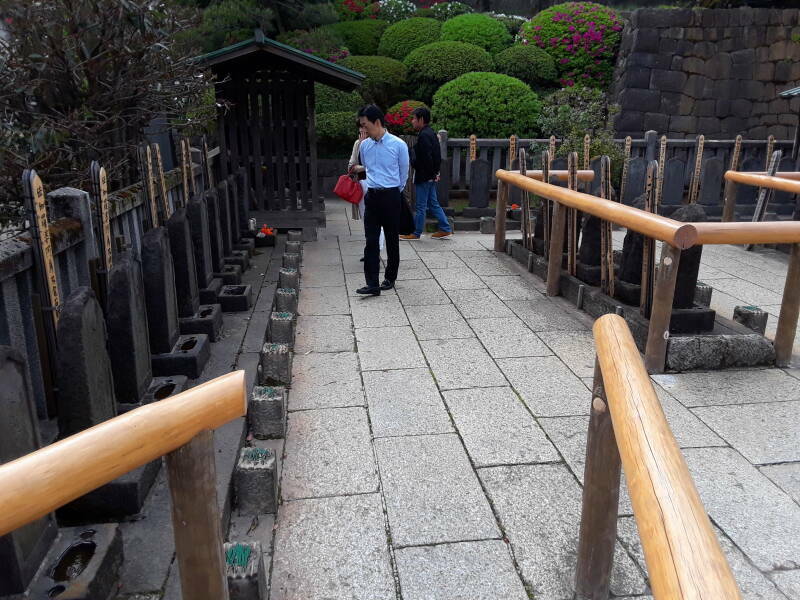 Above and below you also see Asano's grave, outside the fence next to the stone wall. 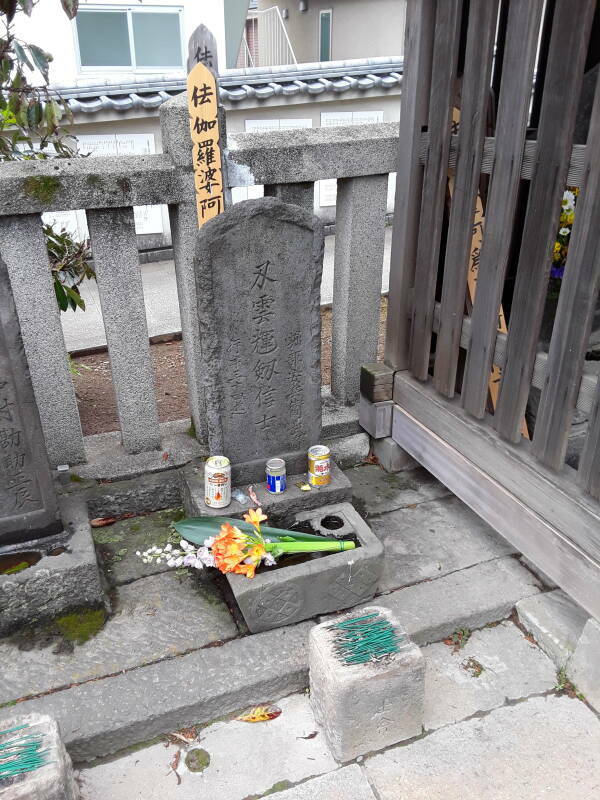 Ōishi Yoshitaka's grave is in a place of honor, in the corner closest to Asano's grave. 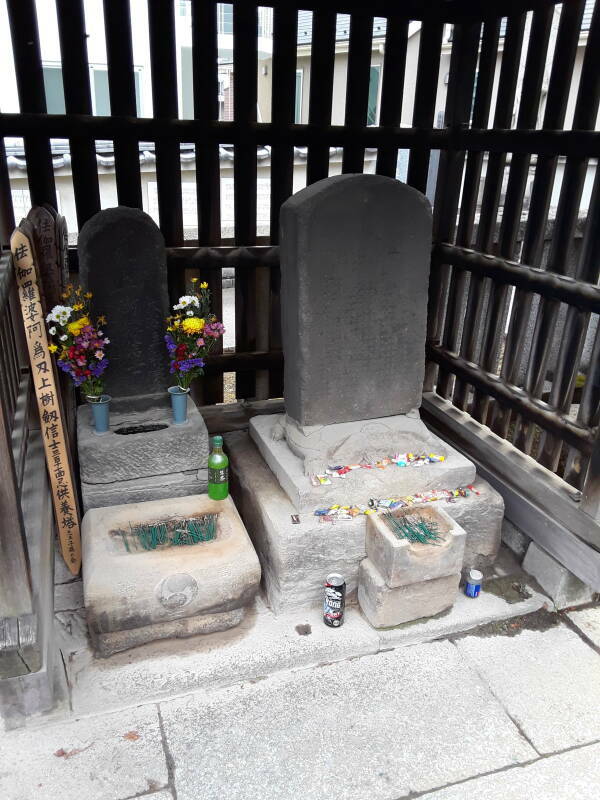 His son, Ōishi Chikara, is buried in the adjacent corner. People visit every day. You can buy bundles of incense just outside the graveyard. Make sure to get 47 sticks. 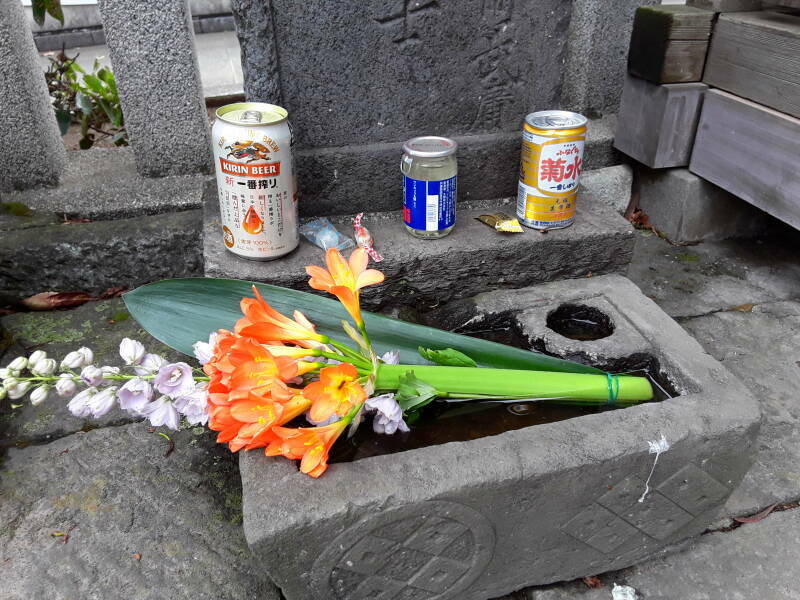 People leave flowers and drinks to honor the 47 rōnin. 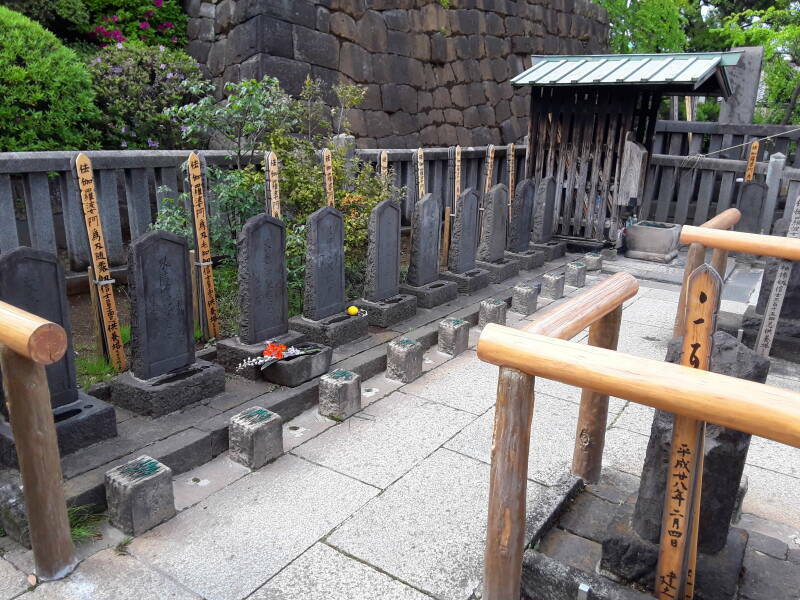 Asano's death had left hundreds of samurai unemployed. The revenge of the 47 rōnin cleared their names, enabling many of them to find work immediately. As you might imagine, the story of the 47 rōnin led first to plays and then to several movies. Toshirō Mifune was in multiple films and television movies depicting the story. The graveyard is especially popular on the anniveraries. April 21st for the original assault and Asano's seppuku, December 14th for the revenge, and February 4 for when the 47 rōnin performed seppuku. Or at least those are the dates as observed today. The actual dates are confusing. Did the 47 rōnin wait "about a year", or "almost two years", or just how long before exacting revenge? Which events happened in 1701, 1702, and 1703? The censorship laws of the Shōgunate prohibited portrayals of current events, so names and dates were changed in the initial versions of the story. The dates were of course in the local calendar of the time. 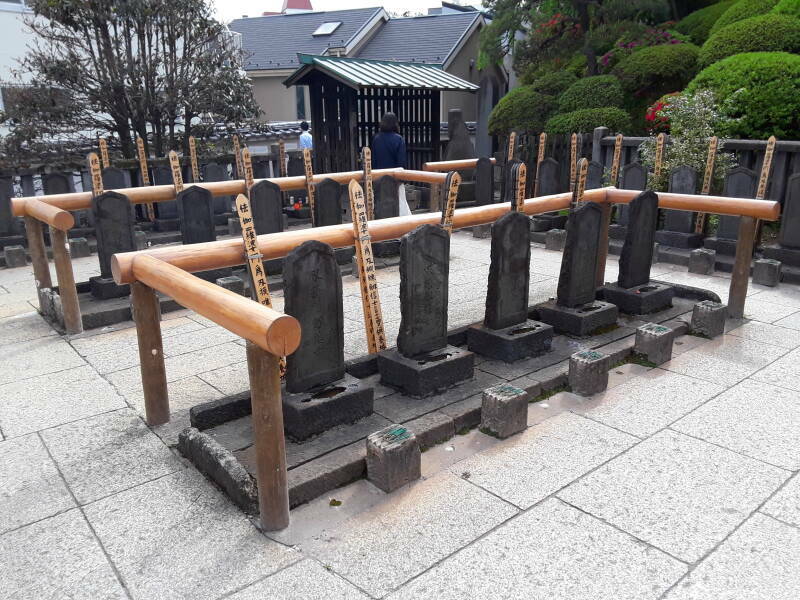 The rōnin performed seppuku on the 4th day of the 2nd month during Genroku 16, referring to the 16th year of the rule of the Emperor Higashiyama. Not necessarily the 4th day of February in Europe. Japan used the Jōkyō calendar at the time. It was based on the Chinese calendar, with the new year starting between what we now reckon as January 20 and February 20. February 8th in 1701, January 28th in 1702, and February 16th in 1703. Then the 4th day of the 2nd lunar month after that. On top of all that, during the early 1700s by European calendars, the new year started on March 25th. March 24th 1701 was followed by March 25th 1702 (and then December 31st 1702 was followed by January 1st 1702). Because, from medieval times until the adoption of the Gregorian calendar, the European new year began on March 25th, "Lady Day", a celebration of the Virgin Mary. It was calculated backward from the assumption that Jesus was born on December 25th, instead of during the spring as Luke's Gospel clearly describes it with the shepherds staying in the fields overnight while the lambs were being born. So yes, the start of the new year in Europe was based on the mis-timed celebration of a Παρθένος Θεοτόκος, a Parthenos Theotokos or Virgin God-bearer. And you thought Japanese religion was confusing.